The blade is 6 inches long, 1 3/4 inches wide and 3/16th thick. Overall length of the knife is 12 inches. The steel is d2 high chrome, high carbon tool steel with a Rockwell hardness of 59. (Note: all newer Sandstorm knives are 60 RC.) The blade is full height, flat ground, with a gradual distal taper and the small false edge at the tip for ease of penetration. It has six 3/16 of an inch carbon fibre pins to hold the entire handle to the full tang. 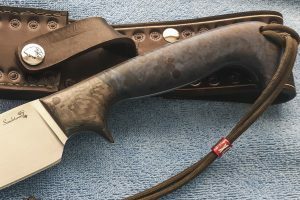 The knife comes with carbon fibre bolsters matched with exceptional grade blue dyed stabilized birch burl scales. Scott added solid carbon fibre liners for lightweight strength and stability, along with a 5/16th carbon fibre thong tube at the base of the handle. 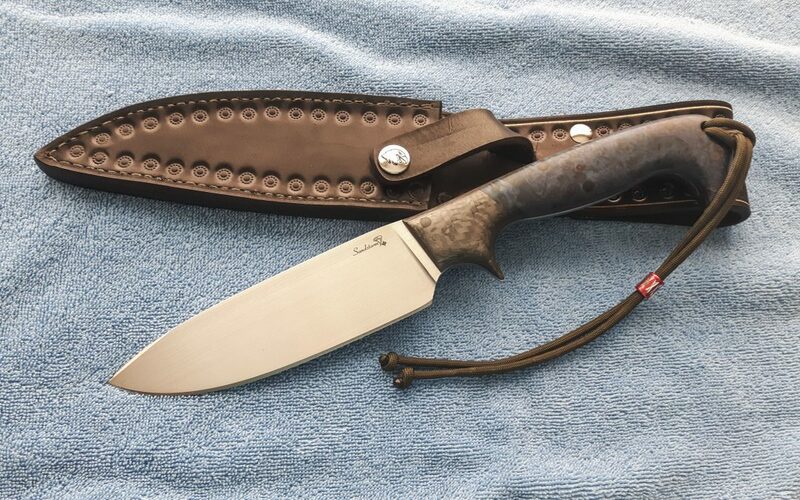 This survival knife is a real beauty and will stand up to any task out in the wilderness. The knife also includes a standard black dyed top quality leather sheath, hand stitched and hand stamped. There’s a grommet place at the tip of the sheath, for multi-position carry. The wrist thong goes through the tube at the base of the handle to be worn so the user has more control of the knife and less chance of the knife slipping out of your hand during wet or slippery conditions. The knife’s edge is convex ground, which produces the strongest and sharpest edge for this style of knife. The back of the blade can be used to shave and strike a ferro rod for building a fire, while the edge can be put to work chopping kindling – splitting it to whatever size you need and it will easily create feather sticks to use for your ferro rod shavings. The purpose of this handcrafted knife was to complete any chore demanded of it. It will chop, split, slice, skin, and cut virtually anything it comes in contact with. When all else fails, this knife will get you out of any situation you may find yourself in. Nothing Can Stop a Sandstorm!